Losing weight can be an overwhelming task that is slow to produce results for some, especially in the beginning of their weight loss endeavors. This can cause a great deal of discouragement for some, who may not realize they need only adapt their approach to weight loss to fit their body’s needs more optimally. These days, there’s a wide array of different exercise plans, diets, and lifestyle changes to choose from. Selecting the right one can often be a daunting task. Many of the fad diets out there today aren’t proven to work, or may only be temporary fixes. It isn’t uncommon on the path to losing weight to find that there aren’t a lot of quick fixes out there that work, and even less that are safe. So what are some of the safe methods to achieving weight loss on a reduced timeline? The answer is medical weight loss. Under the care of a medical weight loss physician, it is possible to reach your goals much more quickly, effectively and safely. Medical weight loss is a weight loss option that is guided by a physician to help ensure the most effective and safe weight loss. A growing number of physicians agree that medical weight loss programs are the safest and most reliable option for you to achieve your weight loss goals in a reasonable and accelerated timeframe. As we mentioned earlier, fad diets and exercises often bring results that are short-lived and are often achieved in an unsafe manner. This is where medical weight loss excels as a cut above the rest with years of research and proven results. There are two main weight loss programs in the realm of medical weight loss, both tailored to work for different types of patients with different needs. Human Chorionic Gonadtropin, or HCG, is the hormone that triggers fat burning in the body. Once injected, the body becomes much more efficient at burning fat. The HCG weight loss program is one of the most encouraging new medical weight loss programs out there. Through a series of injections, appetite suppressants, and an easy-to-follow diet, the HCG weight loss program can help you start shedding pounds fast and keep them off much more easily. The B12 weight loss program is centered on increasing your fat burning engine with vitamin B12 and essential fat-burning amino acids. In addition to B12 injections, you will also receive MIC (methionine, inositol, and choline) lipo injections as well. B12 (in unison with MIC) delivers a powerful boost to your metabolism that helps you burn fat at a remarkable yet safe pace. When used alongside proper diet (and appetite suppressants if necessary), B12 weight loss is one of the most effective weight loss programs out there. What medical weight loss clinic is right for me? Divine Weight Loss is a medical weight loss clinic dedicated to helping you lose weight quickly and safely! Dr. Diana Roque has been practicing internal medicine for well over a decade, which is where her profound interest and background in women’s health & preventative medicine was born. During her medical career, she has worked daily with a variety of patients who suffer from conditions such as, diabetes, hypertension, and heart disease. These medical conditions often share some common ground in that they are preventable with proper weight management practices. Dr. Roque is an expert in the field of medical weight loss who knows that proper weight management looks different from one patient to patient. It certainly can be a difficult journey for anyone to travel alone. 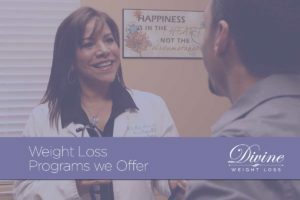 With our specially developed weight loss programs, Dr. Roque will find the right path for you, and help you reach your weight loss goals safely! Call (813) 671-7570 or click here to schedule an appointment today!